The Icon of the Mother of God, named "Quickly-Hearing"
The Icon of the Mother of God, named "Quickly-Hearing" – an ancient wonderworking image, is located on Holy Mount Athos at the Dokhiareia monastery. The monastery tradition suggests that its time of writing belongs to the X Century, during the time of the monastery head Saint Neophytes (Comm. this same day). In the year 1664 the kitchener Nilos, coming at night to the kitchen with a burning torch, heard a voice from the image of the Mother of God raised up over the door, summoning him in future not to walk here and not to soot the icon. The monk thought that this was a prank of some one of the brethren; he disregarded the warning and continued to walk into the kitchen with the sooty torch. Suddenly he fell blind. With fervent repentance the Monk Nilos prayed before the icon of the Mother of God, begging forgiveness. And again he heard the wondrous voice, proclaiming forgiveness and return of sight and a command to announce to all the brethren: "From this time this My icon shalt be name Quickly-Hearing, since quickly to all hastening to it shalt appear mercy and fulfillment of entreaty". The MostHoly Mother of God did then fulfill and now fulfills Her promise – quick help and consolation manifest for all who with faith hasten unto Her. In Russia copies of the wonderworking Athonite image "Quickly-Hearing" were always availed to with great love and veneration. Many of them were glorified by miracles. In particular, instances were noted of healing from the sickness of plague and demonic-possession. 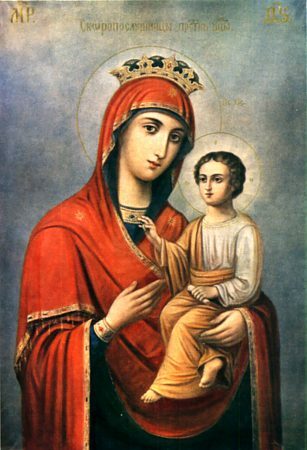 In the year 1938 the Athos Dokhiareia monastery presented to the Russian Spiritual Mission at Jerusalem a copy of the wonderworking Icon of the Mother of God "Quickly-Hearing".